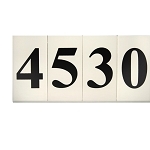 These address signs are made of high quality material designed to withstand years of exposure to weather extremes. 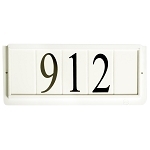 Constructed of tile, limestone, slate, and cast concrete, these solid address plaques have many outstanding features. Some can be illuminated, others offer an acid wash finish, some have have deeply etched numbers, and many have a wide selection of colors and designs. Complete mounting instructions are included.